Folding thinning and stripping blade with wooden handle. 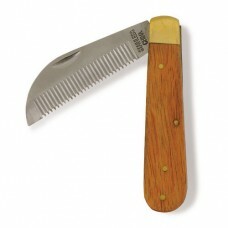 Stainless steel blade is serrated so that it will easily thin and strip manes and tails 7”. Also works well for stripping Dog's coats.